Open the bonnet ONLY after steam is no longer escaping from the engine: Steam from an overheated engine is dangerous. The escaping steam could seriously burn you. Drive safely to the side of the road and park off the right-of-way. Put a vehicle with an automatic transaxle in park (P), a manual transaxle in neutral. Check whether coolant or steam is escaping from the engine compartment. If steam is coming from the engine compartment: Do not go near the front of the vehicle. Wait until the steam dissipates, then open the bonnet and start the engine. 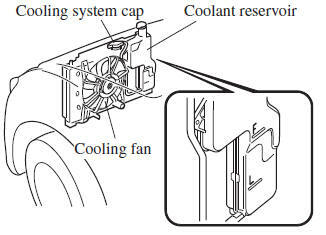 If neither coolant nor steam is escaping: Open the bonnet and idle the engine until it cools. 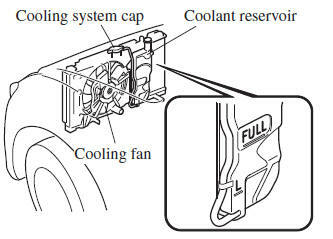 If the cooling fan does not operate while the engine is running, the engine temperature will increase. Stop the engine and call an expert repairer, we recommend an Authorised Mazda Repairer. Make sure the cooling fan is operating, then turn off the engine after the temperature has decreased. When cool, check the coolant level. Stop the engine and call an expert repairer, we recommend an Authorised Mazda Repairer. Carefully add coolant as required (page 6-29 ). If the engine continues to overheat or frequently overheats, have the cooling system inspected. The engine could be seriously damaged unless repairs are made. Consult an expert repairer, we recommend an Authorised Mazda Repairer.